Analog thermo barometer for indoor use (barometer, thermometer, hygrometer), made from carved out and painted slate. The analog Thermo Barometer Domatic Slate comes with a modern design and three well-readable round displays. Through changes in the air pressure, statements about further weather conditions can be made. This is also indicated by three symbols in the barometer. 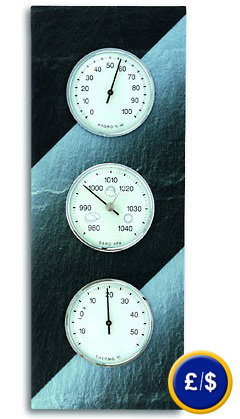 The analog thermo barometer should delight the viewer with not only weather data but also with an attractive appearance. This Thermo Barometer is built from the best materials and contains accurate measurement elements. Please note that this thermo barometer can only be placed indoors. In dry areas such as winter gardens, terraces and greenhouses, this thermo barometer can also be used. Should you require any assistance in finding the product you are looking for, do not hesitate to contact us on: UK customers +44(0) 23 809 870 30 / US customers +1-410-387-7703. An overview of all weather stations can be found here: weather stations Our technicians and engineers will gladly give you advice on this thermo barometer and all other products in the field of measuring instruments, regulation and control and scales. Here you can see further products in the field of "Wireless Weather Station".